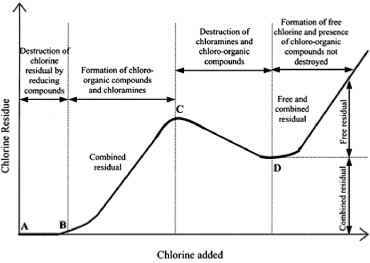 A problem that may occur during chlorination of fisheries effluents is the formation of chloramines. These wastewaters may contain appreciable amounts of ammonia and volatile amines, which react with chlorine to give chloramines, resulting in an increased demand for chlorine to achieve a desired degree of disinfection. The proportions of these products depend on the pH and concentration of ammonia and the organic amines present. Chlorination also runs the risk of developing trihalomethanes, which are known carcinogens. Subsequently, the contact chamber must be cleaned regularly. The degree of disinfection is attributed to the residual chlorine present in water. A typical plot of the breakpoint chlorination curve with detailed explanation is shown in Fig. 18. Initially, the presence of reducing agents reduce an amount of chlorine to chloride and makes the residual chlorine negligible (segment A-B). Further addition of chlorine may result in the formation of chloramines. These appear as residual chlorine but in the form of combined chlorine residual (segment B-C). Once all the ammonia and organic amines have reacted with the added chlorine, additional amounts of chlorine result in the destruction of the chloramines by oxidation, with a decrease in the chlorine residual as a consequence (segment C-D). Once this oxidation is completed, further addition of chlorine results in the appearance of free available chlorine. Point D on the curve is also known as "breakpoint chlorination." 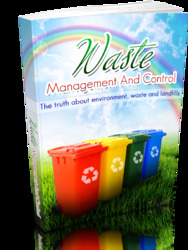 The goal in obtaining some free chlorine residual is to achieve disinfection purpose. Chlorination units consist of a chlorination vessel in which the wastewater and the chlorine are brought into contact. In order to provide sufficient mixing, chlorine systems must have a chlorine contact time of 15-30 minutes, after which it must be dechlorinated prior to discharge. A schematic diagram of the systems is presented in Fig. 19. Figure 18 Breakpoint chlorinating curve (from Ref. 9). the diversity, size, and quantity of fish in receiving streams . 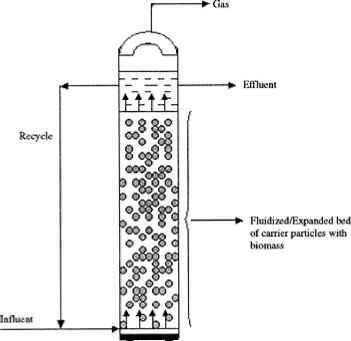 Additionally, the chlorine dosage needed to achieve the residual effect required varies with the wastewater considered: 2-8 mg/L is common for an effluent from an activated sludge plant, and can be about 40 mg/L in the case of septic wastewater [6,7].